Is It Good? 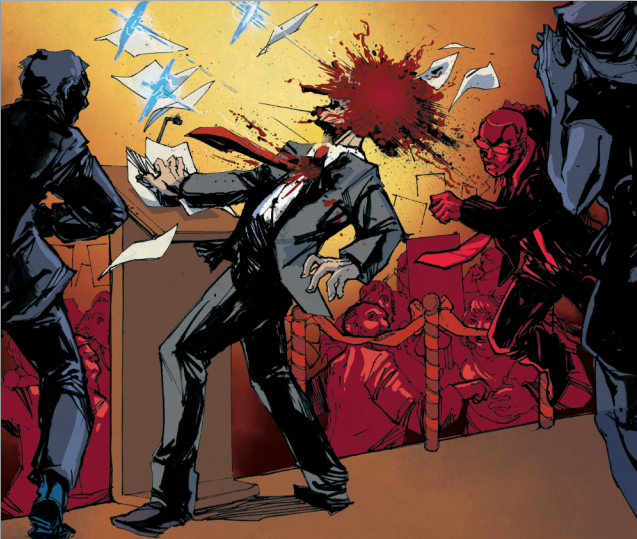 Deep State #5 Review – AiPT! Agents Brand and Harrow begin a new story arc. Is it good? Some dude is killing people with a sniper rifle. His first target is a politician, but his hit list seems a little random after that (which of course, it’s not). Oh, and he also seems to have found an infinite supply of those magic bullets Oswald used on Kennedy. Brand and Harrow utilize some good detective work (and a liberal helping of junk science) to identify and track the shooter down. Along the way, more hints are dropped about the agents’ mysterious pasts, including a climax that reveals a much deeper/sinister layer to the series’ entire mythology. Deep State is the most frustrating title I am reading right now. If it was bad—or even just consistently mediocre—then I could simply write it off and move on. Instead, the title somehow manages to be both incredibly brilliant and seriously flawed. It feels a bit like this after you finish an issue. Justin Jordan’s overall story is excellent. He also does a great job with the dialogue/interaction between Brand and Harrow, perfectly concocting a friendly and antagonistic chemistry. Unfortunately, the story itself jumps and skips like a demon possessed record needle. Things move from one set piece to another with little sense of time or consequence. Other times, stuff happens that doesn’t make sense (like an agent from a covert agency launching a grenade into the side of an office building…then smiling about it). It’s the exact same story with the art by Ariela Kristantina. Many of the panels are absolutely gorgeous, filled with rich detail and kinetic energy. Others look rushed and incomplete by comparison. This leaves both sides of Deep State’s coin spinning wildly on its edge. There’s a great book here (with a lot of talent behind it), but the creative team needs slow down and find their voice for it to happen.